Credit derivatives have been instrumental in the recent increase in securitization activity. The complex nature and the size of the market have given rise to very complex counterparty credit risks. The Lehman failure has shown that these issues can paralyse the financial markets, and the need for detailed understanding has never been greater. 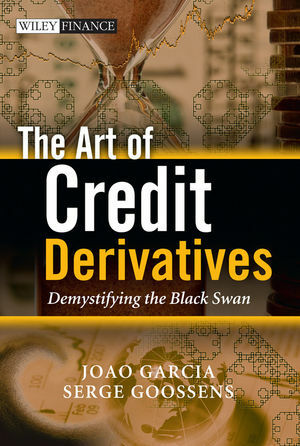 The Art of Credit Derivatives shows practitioners how to put a framework in place which will support the securitization activity. By showing the models that support this activity and linking them with very practical examples, the authors show why a mind-shift within the quant community is needed - a move from simple modeling to a more hands on mindset where the modeler understands the trading implicitly. The book has been written in five parts, covering the modeling framework; single name corporate credit derivatives; multi name corporate credit derivatives; asset backed securities and dynamic credit portfolio management. how to put structured products in a mark-to market-environment, increasing transparency for accounting and compliance. This book will be invaluable reading for Credit Analysts, Quantitative Analysts, Credit Portfolio Managers, Academics and anyone interested in these complex yet important markets. Joao Garcia is the Head of the Credit Modelling team at the Treasury and Financial Markets of Dexia Group in Brussels. His current work includes credit derivatives, securitization and structured products, correlation mapping of credit portfolios in indices, developing strategies and trading signals for credit derivatives indices and pricing distressed credit instruments. Prior to this he worked for four years on the construction of a grid system for strategic credit portfolio management of the whole Dexia Group. The aim of the system was to mange large portfolios of securitization notes. Additionally he has experience on methodologies to rate and price cash flow, CDOs, to allocate credit economic capital and to price exotic interest rate derivatives. he is an Electronic Eng. from Instituto Tecnologico de Aeronautica (ITA, Brazil), with a M.Sc. in Physics (UFPe, Brazil) and a Ph.D. in Physics (UA, Belgium). Serge Goossens is a senior quantitative analyst working on credit derivatives and correlation modelling in the Front Office of Dexia Bank. He has a vast experience with credit derivative instruments, both rating and pricing for hedging and trading. He has also focused on mark to model of hard to value distressed assets and on restructuring the capital structure of large portfolios. From his previous positions he has extensive expertise in parallel large scale numerical simulation of complex systems, ranging from computational fluid dynamics to electronics,. Serge holds a M.Sc. in Engineering and a Ph.D. from the faculty of Engineering of the K.U.Leuven and a Master of Financial and Actuarial Engineering degree obtained from the Leuven School of business and Economics. He has published a number of papers and he has presented at conferences world-wide. 3 Modeling Dependence with Copulas. 3.3 Using Copulas in Practice and Factor Analysis. PART II SINGLE NAME CORPORATE CREDIT DERIVATIVES. 4.2 Credit Default Swap: A Description. 4.4 Calibrating the Survival Probability. 4.6 The Big Bang Protocol. 5 Pricing Credit Spread Options: A 2-factor HW-BK Algorithm. 5.2 The Credit Event Process. 5.4 Hull–White and Black–Karazinsky Models. 6 Counterparty Risk and Credit Valuation Adjustment. 6.2 Valuation of the CVA. 6.3 Monte Carlo Simulation for CVA on CDS. 6.6 CDS with Counterparty Risk. PART III MULTINAME CORPORATE CREDIT DERIVATIVES. 7.2 A Brief Overview of CDOs. 7.3 Cash versus Synthetic CDOs. 7.4 Synthetic CDOs and Leverage. 7.5 Concentration, Correlation and Diversification. 8.2 Credit Default Swap Indices. 8.4 iTraxx, CDX and their Tranches. 8.5 Theoretical Fair Spread of Indices. 9 Pricing Synthetic CDO Tranches. 9.3 Implied Compound and Base Correlation. 10 Historical Study of Lévy Base Correlation. 11 Base Expected Loss and Base Correlation Smile. 11.2 Base Correlation and Expected Loss: Intuition. 11.3 Base Correlation and Interpolation. 12.2 Correlation Mapping for Bespoke Portfolios. 13 Correlation from Collateral to Tranches. 13.3 Monte Carlo Simulation and Importance Sampling. 13.4 Gaussian Copula Tranche Loss Correlations. 13.5 Lévy Copula Tranche Loss Correlations. 13.6 Marshall-Olkin Copula Tranche Loss Correlations. 14.2 The Waterfall of a Cash Flow CDO. 15 Structured Credit Products: CPPI and CPDO. 15.3 Swaptions on Credit Indices. PART IV ASSET BACKED SECURITIES. 16.2 ABCDSs versus Corporate CDSs. 16.3 ABCDS Pay As You Go: PAUG. 17 One Credit Event Models for CDOs of ABS. 17.2 ABS Bond and ABCDS. 18 More Standardized Credit Indices: ABX, TABX, CMBX, LCDX, LevX. 19 1-factor Models for the ABS Correlation Market Pricing TABX Tranches. 19.3 Amortizing Bond and CDS. 19.4 A Simple Model for Amortization and Prepayment. 19.6 Prepayment and Model Calibration. 20 Bond Price Implied Spreads. 20.2 Bond Price Implied Spreads. PART V DYNAMIC CREDIT PORTFOLIO MANAGEMENT. 21 Long Memory Processes and Benoit Mandelbrot. 21.2 Econophysics, Fat Tails and Brownian Motion. 21.3 Long-term Memory and the Nile River. 21.4 Capital Asset Pricing Model. 22 Securitization and the Credit Crunch. 22.2 Correlation and Mortgage-backed Securities. 22.3 Securitization and Economic Growth. 23 Dynamic Credit Portfolio Management. 23.2 Regulatory Capital and Basel Formulas. 23.3 Portfolio Credit Risk and Economic Capital. 23.4 Securitization and CDO Models. 23.6 Credit Portfolio Management and Correlation Mapping. 23.7 Strategic Credit ECAP Management. Appendix A: Economic Capital Allocation Approaches. Appendix B: Generalized Gauss Laguerre Quadrature.